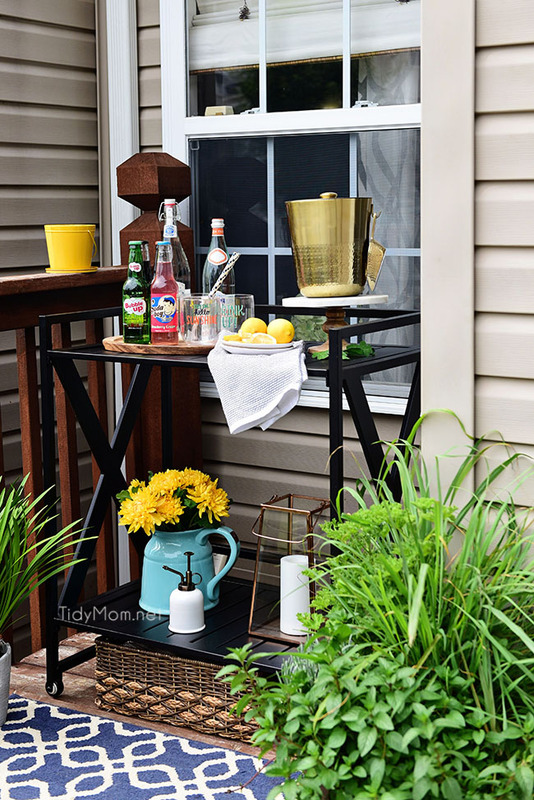 Maximize Outdoor Space! 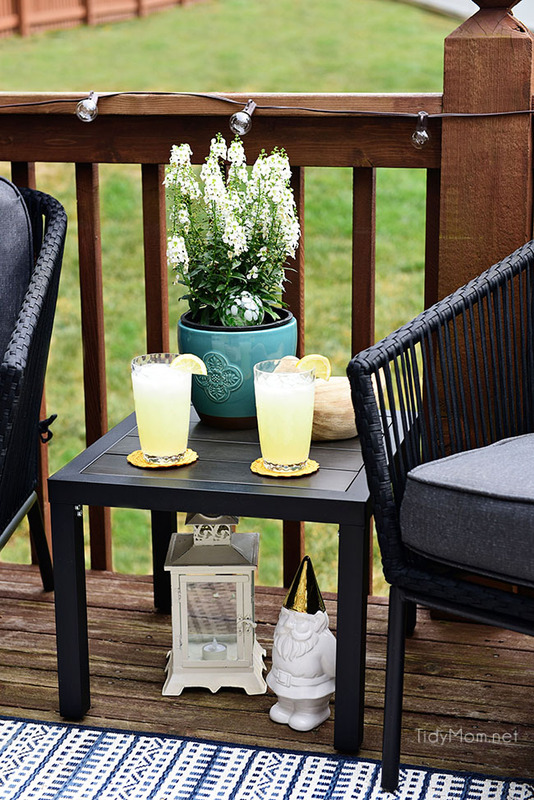 Learn How to Decorate a Small Deck or Patio. 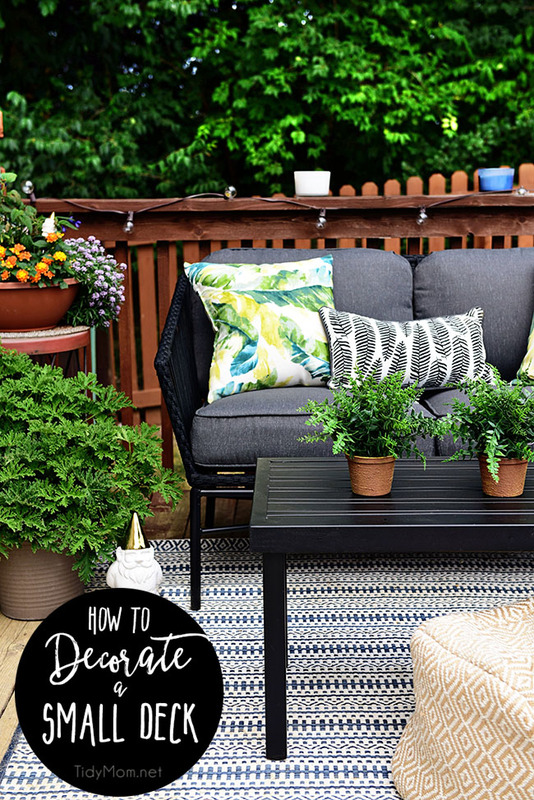 I’m sharing a few tips on getting the most out of your small space along with what plants to use to keep mosquitos and other pests away. I feel like I’m late to the party. 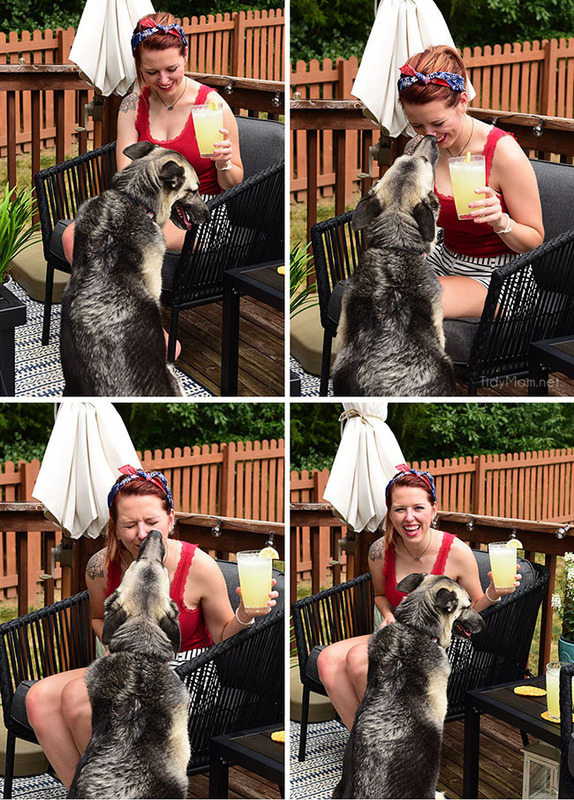 Here it is, the last month of summer and I’m finally sharing how I decorated our small deck with you. 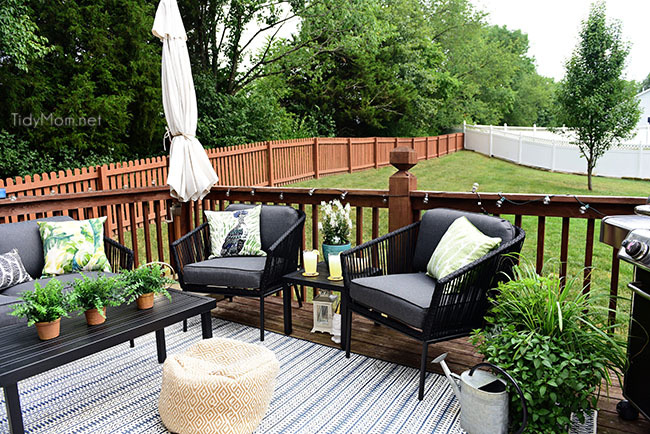 It all started when I got a new rug for the deck and I quickly realized how none of our deck furniture matched, it was getting very worn looking and I had been wanting a big deck umbrella since we get a lot of sun on our deck all day. If you follow me on Instagram I shared the whole process on my IG story. I finished it all up by the end of June, took pictures…….then July came, it got hot outside, I was super busy and I simply forgot to edit the pictures and post them here. 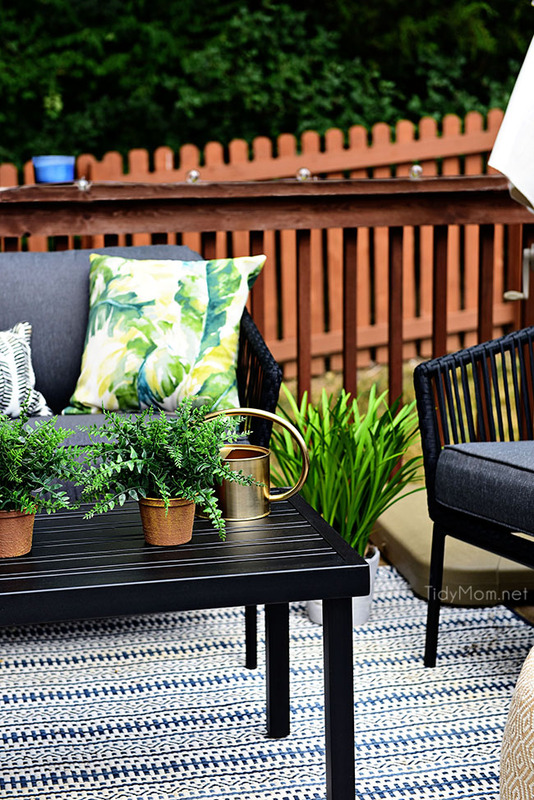 But, today is the day and I’m excited to share the space along with a few tips on how to maximize outdoor space and decorate a small deck or patio. Our deck is off our breakfast room, it’s not tiny, but it’s by no means large. Since this was not a planned process, I can’t find a before picture to show you. We had a small iron bistro table and chairs that were hand-me downs from my mom, to our daughter then to us (now we passed the set on to our youngest). We also had a small wood-frame sofa and coffee table that I picked up at Menards 2-3 years ago. They were pretty inexpensive, so they were really showing wear from the sun and elements. We rarely sat out there. I’ve been eyeing outdoor furniture sets for a while, but didn’t really know what I wanted, until I saw my friend Kim’s new small patio decor! BINGO!!! I knew I wanted that patio set!! We rarely ate at the bistro table, so I knew it needed to go. Conversational seating made a lot more sense and the whole space just flows better. And a big 10′ umbrella in the corner gives us shade to sit out there any time of day! Color Palette: You’ll want the space to reflect your personality or be an extension of your inside space. You also want it to be comfortable and welcoming to other people. Colors have energy and evoke emotion. If you go with neutral furniture, you can bring in color with rugs, pillows, cushions, greenery, and plants. Bold patterns and colors will add drama, while neutral palettes can create a more serene look. 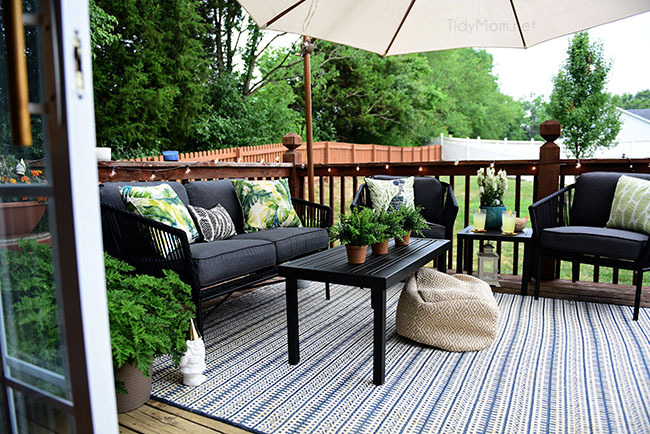 Anchor Your Seating: Just like indoor area rugs, outdoor rugs are both functional and stylish. Choose an outdoor rug to anchor your seating, whether it’s conversational, or for dining. You can even select a large outdoor rug that covers most of the deck, to keep your outdoor space clean and protect the deck. Define Furniture Priorities: If you are limited on outdoor space, you will want to consider how you be using it. Dining al fresco? Relaxing to enjoy the view? Entertaining? Choose furniture that best suits your needs. 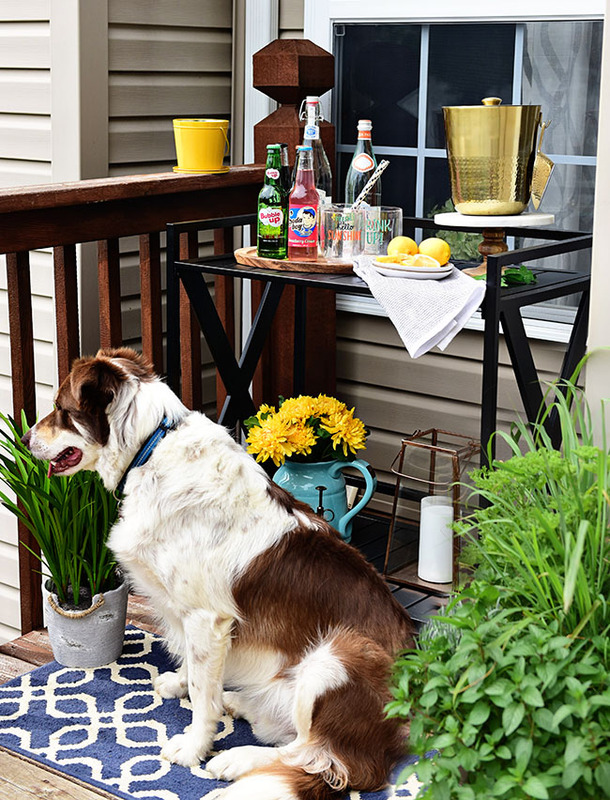 If you don’t plan on dining outdoors, there’s no need to squeeze in a dining table. Comfortable Furniture: Choose furniture that is comfortable and attractive. 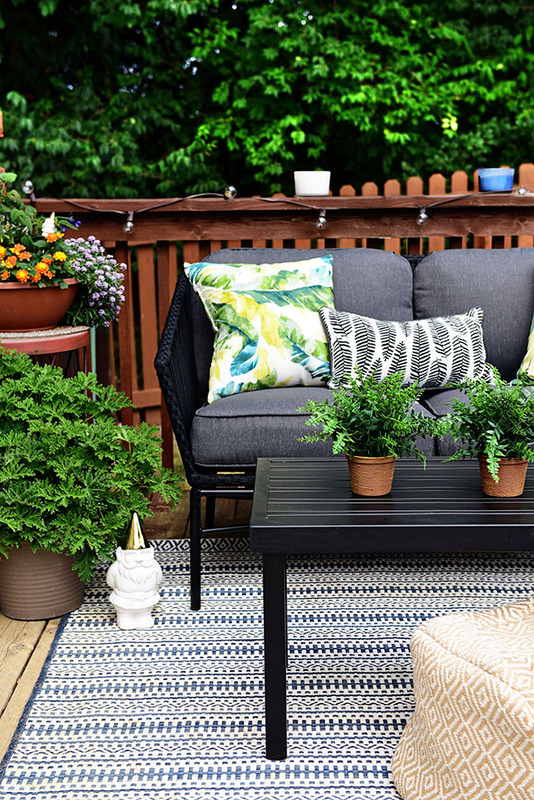 Add outdoor throw pillows and cushions with mold resistant fabric to accent your color palette, and create a cozy and inviting seating area. 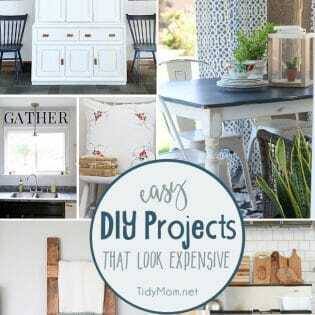 Stay away from bulky furniture that can overwhelm your small space. Outdoor Lighting: Lighting helps set the mood and tone of your outdoor space. String lights and lanterns can turn tiny spaces into a cozy retreat! Add Greenery: Use plants and greenery to bring your space to life. 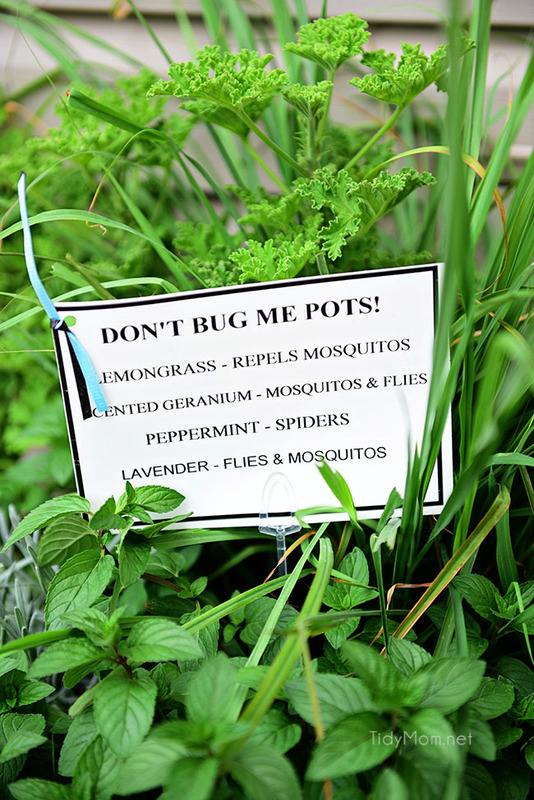 Select a few insect repelling plants to pull double duty!! 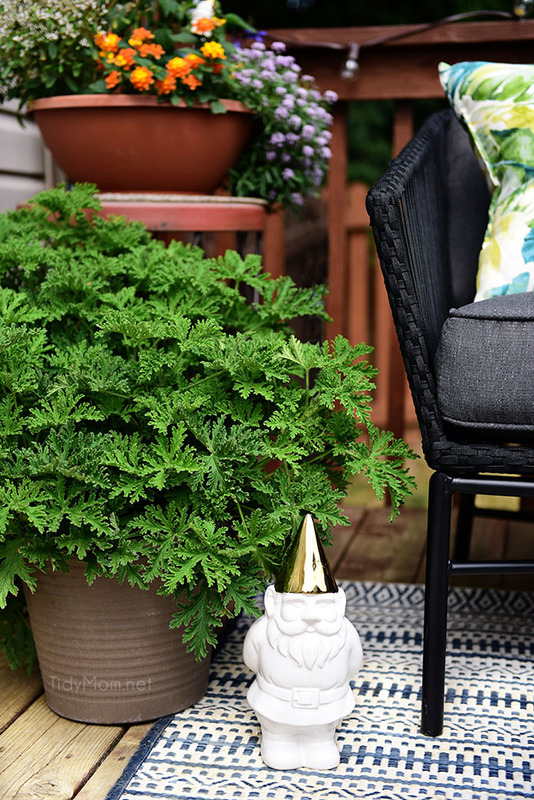 When you create your outdoor living space, be sure to pick up a few plants that not only look pretty but can actually help repel mosquitos and other insects reducing the need for deet sprays and citronella candles. My favorite local nursery created Don’t Bug Me Pots! I also picked up a big Lemon Scented Geranium. The strong lemony aroma repels mosquitos, looks and smells pretty and it’s drought tolerant, so it’s perfect for our sunny deck. My flowering plants have been getting fed Miracle-Gro’s Bloom Booster once a week, and I have to tell you how much I love that stuff!! This is the second year I’ve used it and my flowers on the deck and in our front landscape looks gorgeous!! even after a week of 100+ temps recently!! Now that it’s August, it’s actually cooled off here in St. Louis (which is not the norm- but I’m not complaining). We’re enjoying kicking back out here with a strawberry basil moscow mule, frozen raspberry margaritas or a big glass of homemade lemonade. The pups are enjoying the new outdoor space as well!! I picked up a bar cart that I can use for entertaining. We have the perfect little alcove spot on the deck for it! I set one of the Don’t Bug Me pots right next to it, to keep insects away from the food and drinks. I just can’t get over how pretty our small deck looks now! We’ve used this outdoor space more in the last few weeks than we have in the last few years! Now I can’t wait to get the deck restained…….and MAYBE a new composite deck in a few years!! We get full sun all day long, so something maintenance free would be really nice! 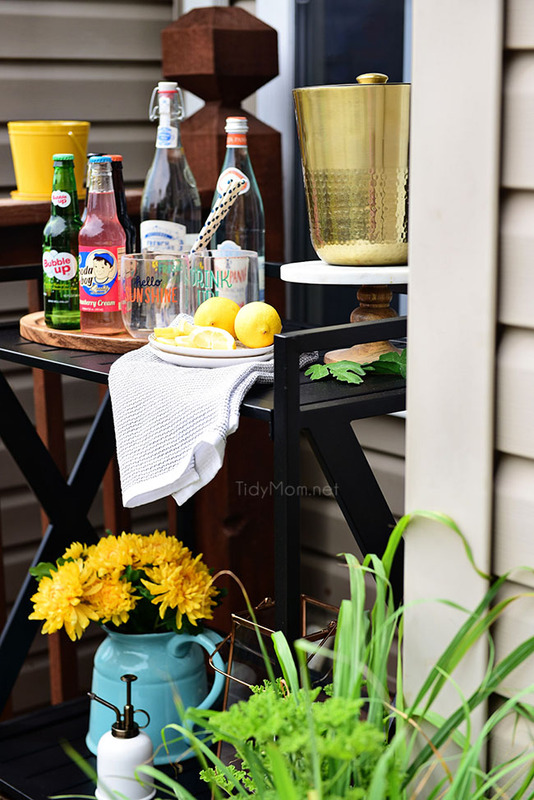 I hope I’ve inspired you to Maximize Outdoor Space and Decorate Your Small Deck or Patio. Wonderful advice, loved the whole look of your deck. I have a smaller deck and used almost all of your suggestions before hand. Except for a rug which I have been trying to decide if I should get??? Thank you for a wonderful post. Love your color scheme! It all looks beautiful! I love an outdoor space update. 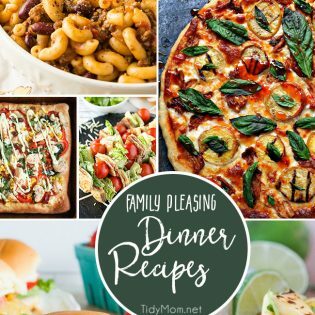 this looks great and so inviting! What a gorgeous space!! Love the styling! Thank you for sharing about the lemon scented geranium. 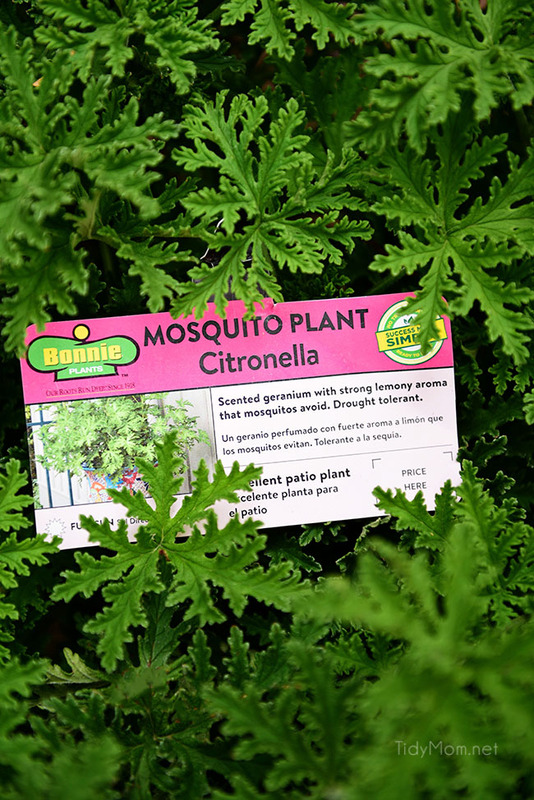 I’ve been looking for a good plant that gets rid of mosquitoes! You make a great point that lighting helps set the mood and tone of your outdoor space. My mom wants to mix things up on her deck this year to give it a different look, and I think lighting would be a great way to do that. I’m sure she would really like to find some nice lights that would compliment the rest of the decor nicely. 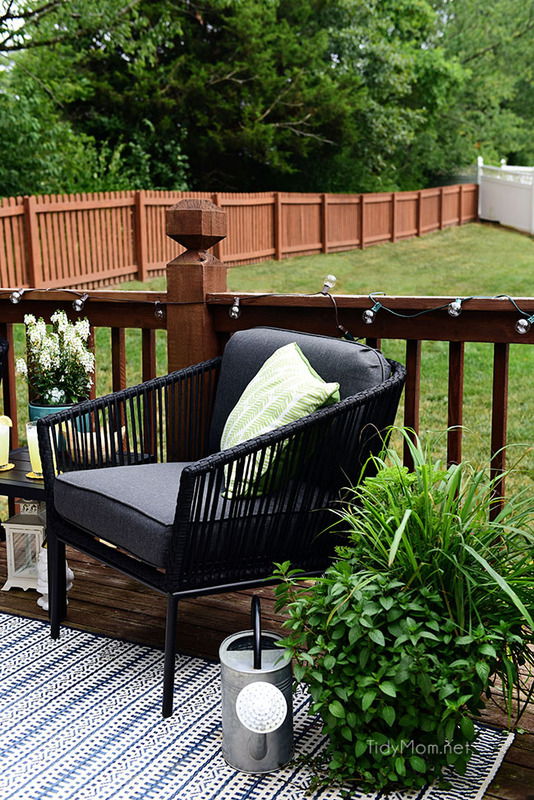 You’ve got some great tips for decorating a deck. We want to put a deck in this year, and I want to make sure to make it look phenomenal. I’ll be sure to take your advice and add some conversational seating, like you said you did. Thanks Ridley. We are hoping to put up a new deck later this year or next year as well!